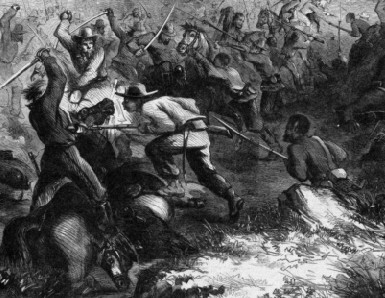 On Wednesday, October 29, 1862, the 1st Kansas Colored Volunteers fought and repelled a superior force of rebel cavalry in Bates County, Missouri. The action occurred before the enactment of the Emancipation Proclamation (January 1, 1863) and long before the men of the 54th Massachusetts stormed Fort Wagner. Although the primacy of this engagement in the chronology of the African American fighting man's experience during the Civil War is acknowledged by the National Park Service, the State of Missouri, the State of Kansas, and scholars alike, no comprehensive study of the engagement has occurred - until now! Alas, there is no memorial to the bravery and sacrifice of the African American troops that day. Ironically, the names of those men killed in the engagement, the first to be killed in action during the Civil War from an African American regiment, (1 white officer, 6 African Americans, and 1 Cherokee Indian) do not appear on the African American Civil War Memorial in Washington, D.C. The reason for the omission of their names is because the Skirmish at Island Mound occurred before the troops involved had actually been mustered into federal service, and the names upon that national memorial were taken from the muster rolls and the Adjutant General's reports of the various states. Over the past two years I have thoroughly studied the engagement using known accounts of the action as well as additional contemporary accounts I discovered along the way. The uncovering of additional accounts of the engagement better illuminate the action, and make it possible to finally tell the story of the Skirmish at Island Mound. I invite you to join with me in celebrating this blow struck for freedom - the first struck by an African American regiment during the American Civil War. Also, I ask your help and support in honoring the memory of the men who fought in this engagement, and in my efforts to see the ground upon which this historic engagement was fought properly preserved and protected. This was the first engagement of the American Civil War in which African American soldiers engaged and defeated Confederate forces in combat. This was the first union victory in which an African American officer (Lieut. Patrick Minor) commanded African American Soldiers (Co. D, 1st Ks. Col. Vol. Inf. Regt.) in combat. The First Kansas Colored Volunteer Infantry Regiment was the first regiment of African American soldiers from a northern state to join the Union army during the Civil War. The conduct and bravery exhibited by the African American troops proved his ability to fight. Help me spread the word about this web site.